Ⅳ. Since 2014 Guangzhou administrative division has been adjusted. The original Huangpu and Luogang districts have been merged into the new Huangpu district. The original Zengcheng county-level city has been renamed Zengcheng district, the original Conghua county-level city has been renamed Conghua district. Since 2015, Guangzhou city administrative division has included 11 districts, which are Liwan district, Yuexiu district, Haizhu district, Tianhe district, Baiyun district, Huangpu district, Panyu district, Huadu district, Nansha district, Conghua district and Zengcheng district, excluding county-level cities. Ⅴ. From 2014 urban and rural integrated household survey is carried out in Guangzhou, statistical indicator system of urban and rural integrated household survey is changed greatly. Ⅵ. According to the notice of the National Bureau of Statistics on the implementation of the new national standard of national economic industry classification (2017) 142, the new national economic industry classification has been used from the statistical annual report of 2017 and the periodic statistical report of 2018. In this data, all the tables related to sub-industries (except the data provided by individual departments are classified according to the old industry, as indicated in the table), are adjusted according to the new industry classification & GB/T4754-2017 of national economy. Ⅶ. Starting from 2018, a new chapter entitled “Service Industry above scale” has been added. Ⅹ. In the Yearbook all caculating errors of some total and regular figures for the differency of measuring units haven’t been adjusted. Ⅺ. Notations in this book：blank space indicates data are not available；“…” indicates not large enough to be rounded into the least unit of measurement；“#”indicates major item in a category. 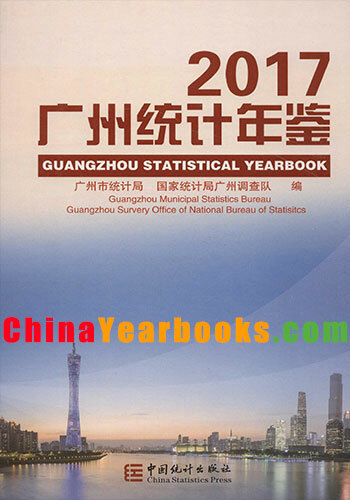 Ⅰ.Guangzhou Statistical Yearbook 2017(abbreviation as the Yearbook below)is anannual statistics publication,reflecting comprehensively the economic and social developmentof Guangzhou.It covers maily statistics in 2016 and some selected major data series inhistorically important years,at municipal level and local level of district. Ⅱ.The Yearbook contains the following 17 chapters:1.Gerneral Survey;2.Population;3.Employment and Wages;4.Investment in Fixed Assets;5.energy andenvironmental protection;6.Government Finance and Financial;7.Price Indices;8.People’s Livelihood;9.City Construction;10.Agriculture;11.Industry;12.Construction;13.Transport,Postal and Telecommunication Services;14.DomesticTrade;15.Foreign Economy and Tourism;16.Science and Technology;17.Education,Culture,Sports,Public Health,Social Welfare and Others.The data listed in the Appendixare main economic indicators of China,Guangdong province,Hongkong SpecialAdministrative Region and Macao Administrative Region. 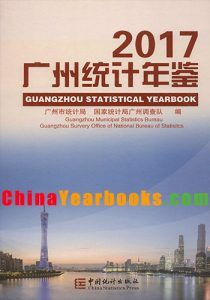 Ⅲ.The data in the Yearbook are mainly obtained from regular ststistical reports andsample surveys conducted by statistics bureaus of all levels of government and the Surney officeof the National Bureau of statistics in Guangzhou.Some data are collected from thedepartments of the provincial and municipal government. Ⅳ.Since 2014 Guangzhou administrative division has been adjusted.The originalHuangpu and Luogang districts have been merged into the new Huangpu district.The originalZengcheng county-level city has been renamed Zengcheng district,the original Conghuacounty-level city has been renamed Conghua district.Since 2015,Guangzhou cityadministrative division has included 11 districts,which are Liwan district,Yuexiu district,Haizhu district,Tianhe district,Baiyun district,Huangpu district,Panyu district,Huadu district,Nansha district,Conghua district and Zengcheng district,excluding county-level cities. Ⅴ.From 2014 urban and rural integrated household survey is carried out in Guangzhou,statistical indicator system of urban and rural integrated household survey is changed greatly. Ⅵ.The prices used in calculation in the Yearbook are current prices except noted. Ⅶ.In any case the data of this book shall be deemed as the authoritative ones. Ⅷ.In the Yearbook all caculating errors of some total and regular figures for thedifferency of measuring units haven’t been adjusted. Ⅸ.Notations in this book:blank space indicates data are not available;”…”indicates not large enough to be rounded into the least unit of measurement;”#”indicatesmajor item in a category.